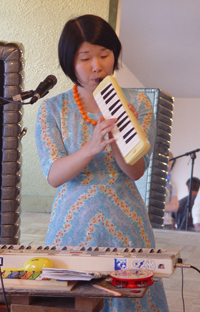 Yasuko from The Bad Spellers, a Tokyo- based pop duo on a tour of the US. Thanks to everyone who made it out to Saturday's opening of Zzzzz... (Between the Sheets). It was an all-day event with some talented performers from Portland and beyond. Imaginary Airship started things off, followed by The Ocean Floor. Next were our friends Tony & Yasuko, aka The Bad Spellers, who came all the way from Tokyo to perform. Capping off the night, was Emily Katz (link to artist page), singing from a bed of clouds. Thank you Rumpspankers for the deliciously inventive cookie platter (kung pow peanut, wasabi, and jalepeno flavored) and chef Aaron Silverman for providing the artists' meal! If you missed the opening reception of Zzzzz... (Between the Sheets) you can catch the highlights online here.